Last post about Greece, I promise! 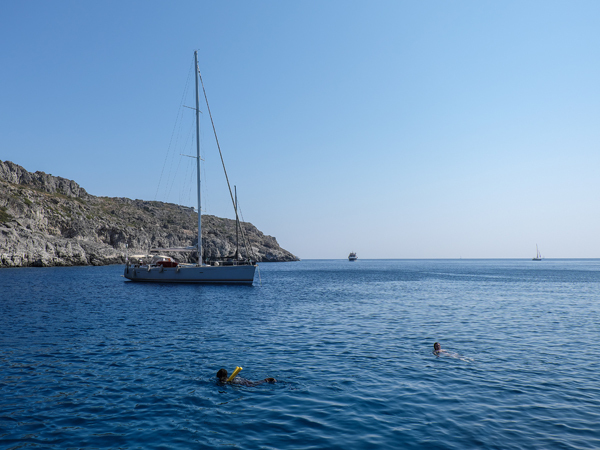 On our final day in Rhodes, we managed to book a day trip out to visit the town of Lindos by boat. We had tried to arrange the same excursion earlier that week, but it had been booked solid by the time we made up our minds to go. Luckily for us, since our flight left late on our last day, we were able to pack first thing, check our bags, and spend the day in Lindos before our flight back to London. Seeing as how we would have had to check out early that day anyways, it worked out quite perfectly! Now, I will say, the whole ‘boat trip’ part wasn’t exactly how I imagined it would be. For some reason, when we booked it through our Thompson Cook hotel representative, I was imagining a small boat with like 15-20 people. No, no, no, it was a ferry of a boat with like 100 people, or more! One of the two day trips that we took while staying in Rhodes, was to the old town. A walled part of Rhodes set along the water, it’s the oldest inhabited medieval town in all of Europe! beautiful bougainvillea vines growing all over the place! Now seeing as how Richard and I both had three weeks off from work, we didn’t spend the whole holiday painting! A week of that was more than enough, so we jetted off to relax a little on the Greek island of Rhodes. When it comes to our vacation styles, we both enjoy visiting places with lots of cultural stuff to do… but this trip was all about doing nothing. Richard’s work means he sometimes has to go away for huge chunks of time (he was about to go away for 6 weeks), so we saw this as a great excuse to go somewhere and just relax in each other’s company. Rhodes, as we discovered, doesn’t look like the Greek postcard we had in mind. Most of the older architecture on the island could be described as medieval in style, so it’s not the island to visit if you want to have lots of pretty photos of little white hillside villages with blue accents (darn). What it does have are cheap flights and lots of all inclusive beach-side resorts!